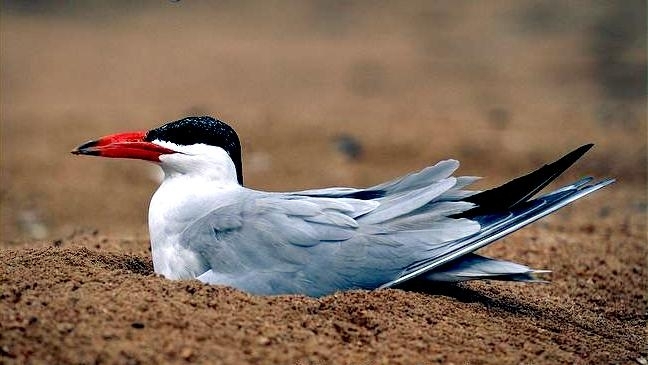 As large as a big gull, the Caspian Tern is the largest tern in the world. 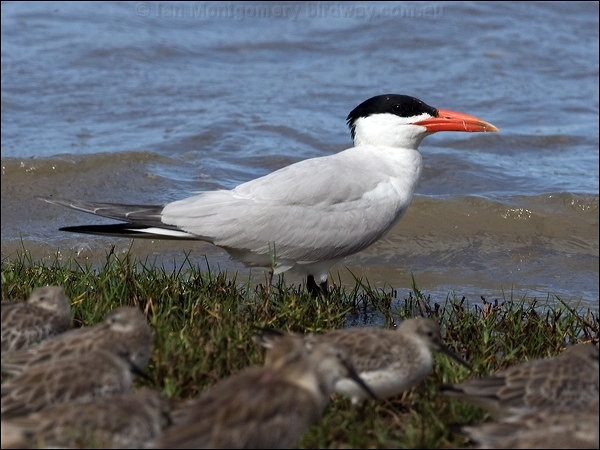 Its large coral red bill makes it one of the most easily identified terns throughout its worldwide range. 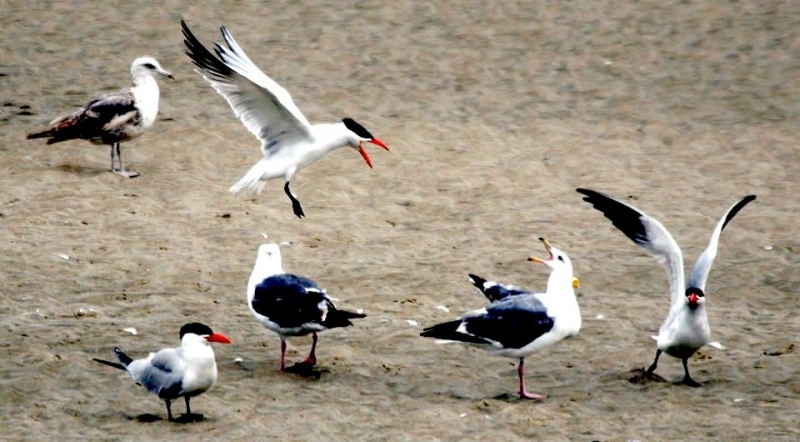 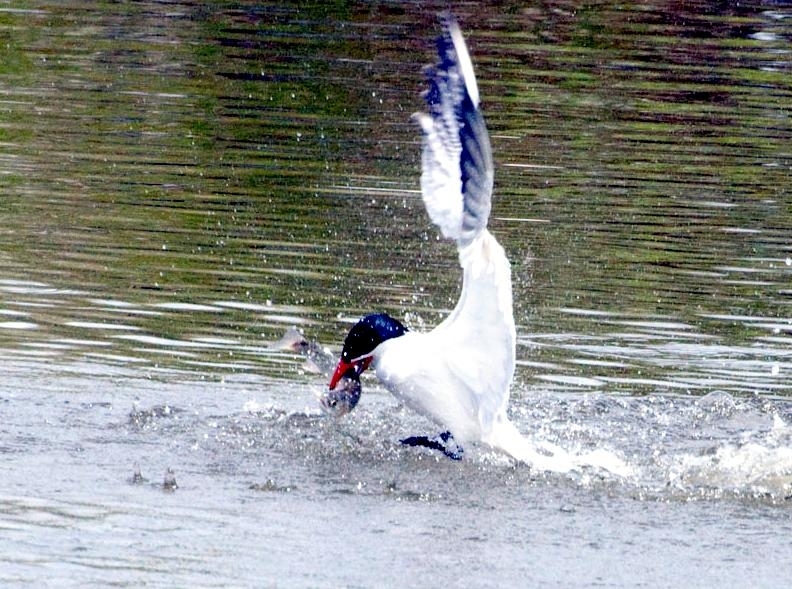 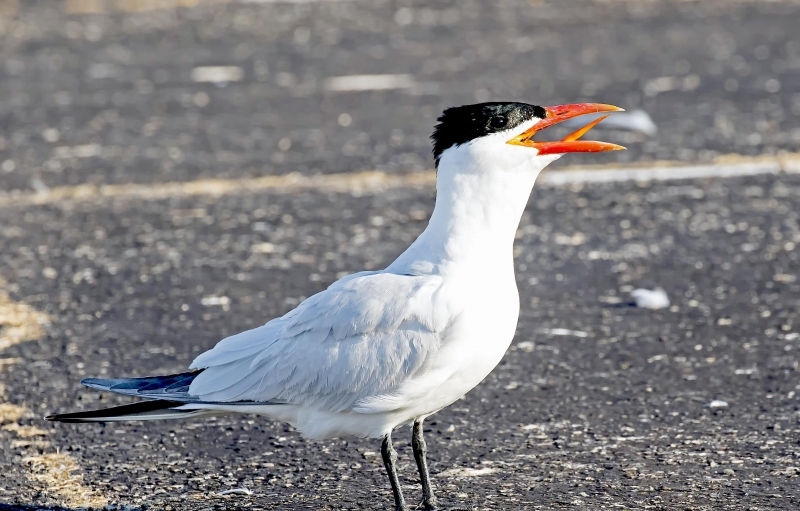 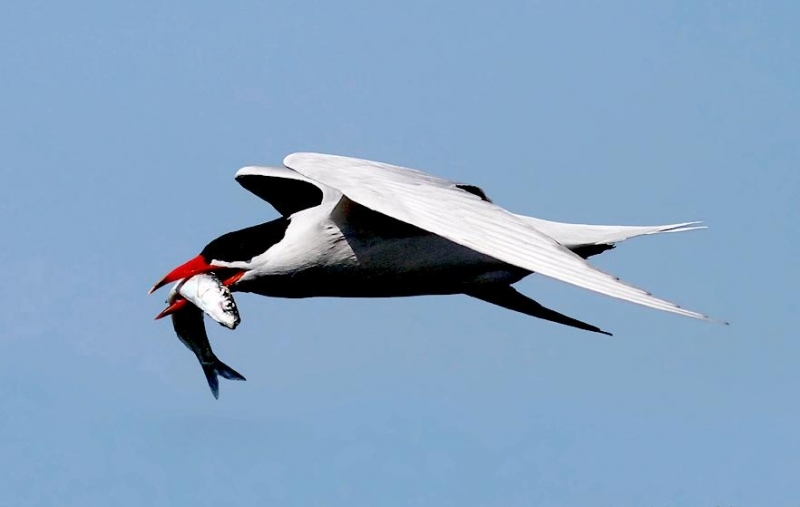 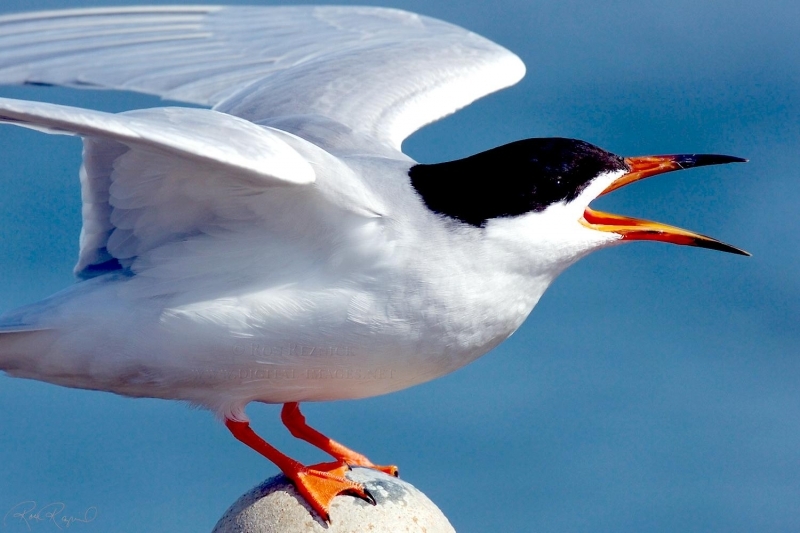 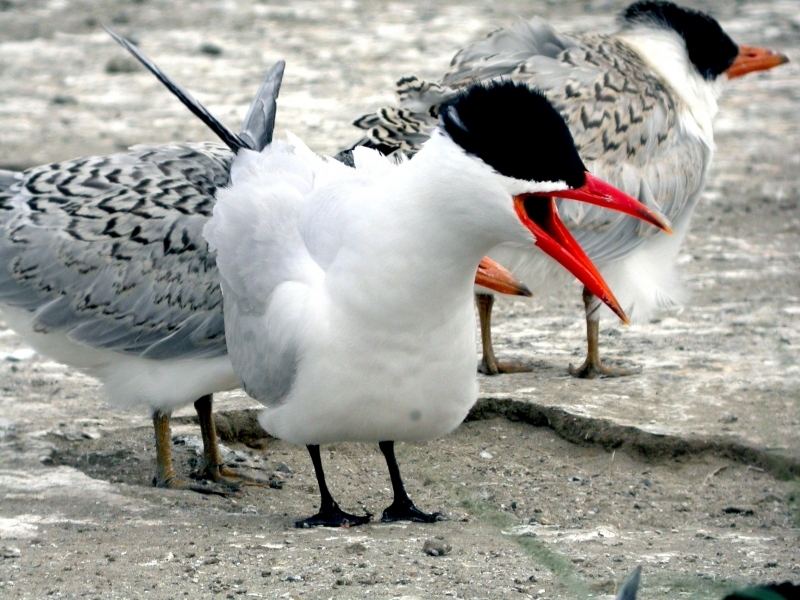 A harsh loud call is the first thing you will probably notice about the Caspian Tern. 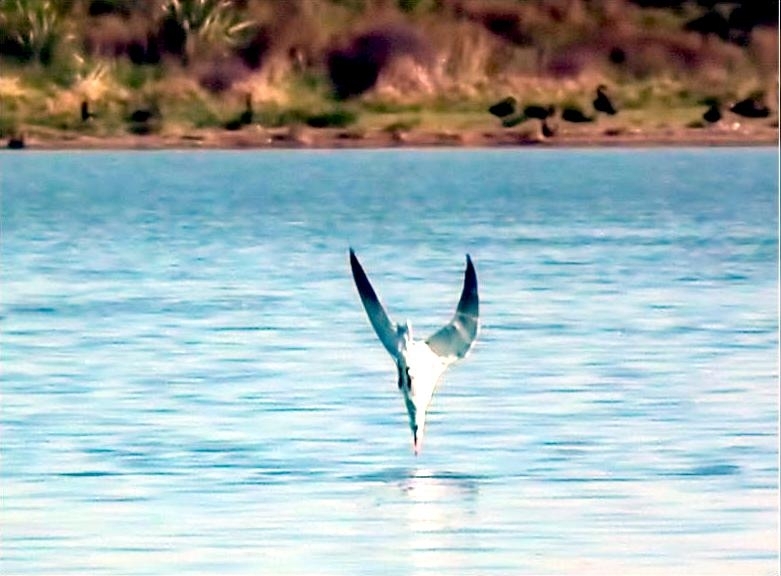 When foraging flies high over water, hovers then plunges to catch fish below surface. 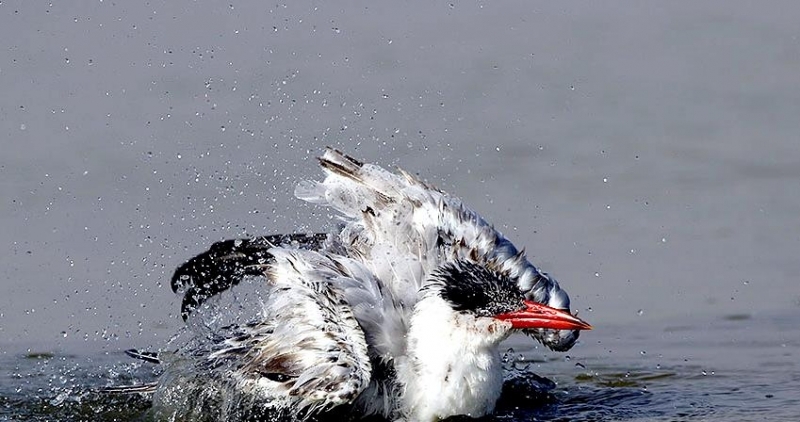 Less often flies low, dips down to catch prey at water’s surface and will also steal food from other birds. 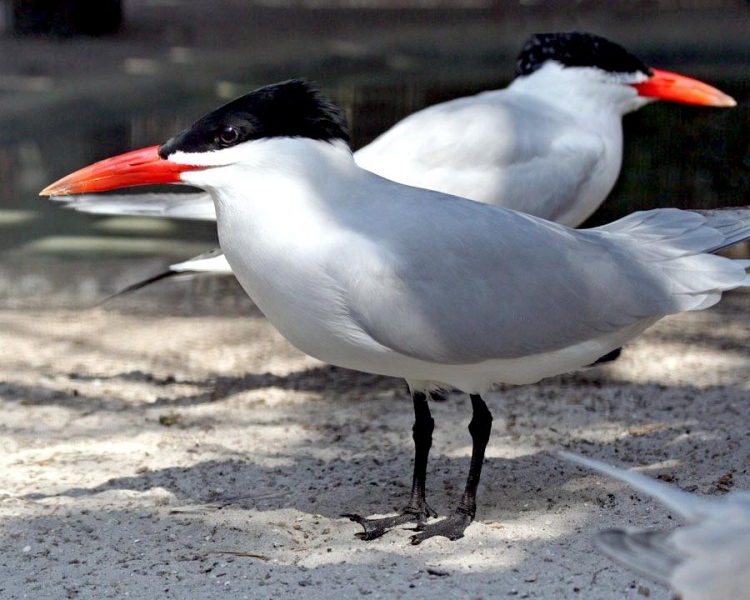 During breeding, the Caspian Tern is mostly white with a black cap, which covers the head from the bill to the nape of the neck. 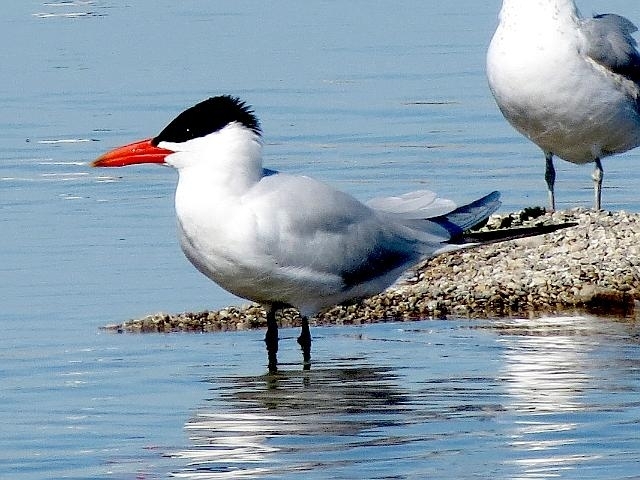 The black crown is squared off at the rear and has a slight crest. 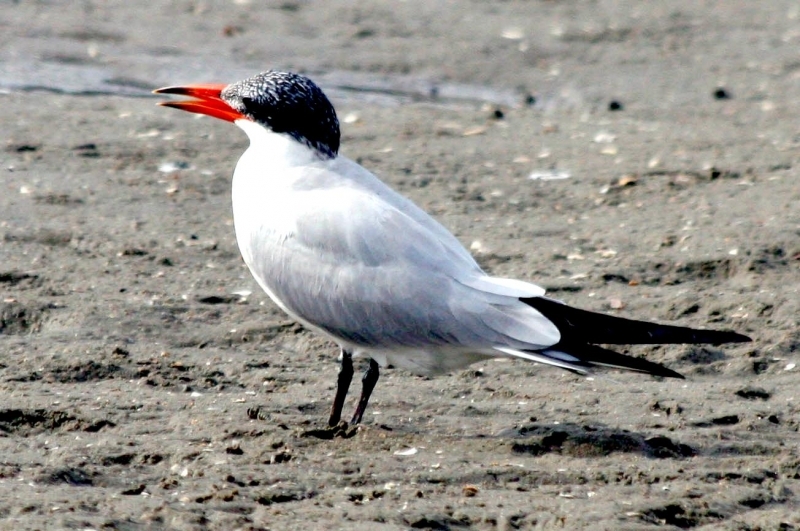 It has a pale gray back & wings and a heavy bright red bill. 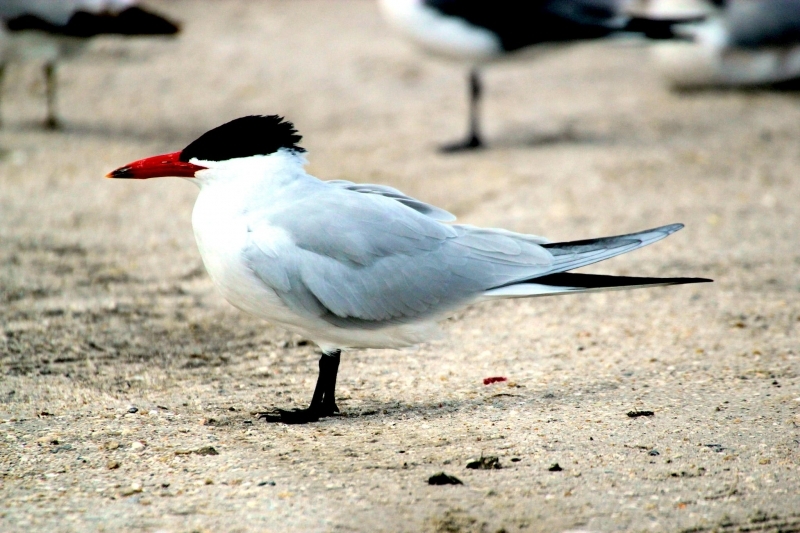 The thick bill has a black tip. 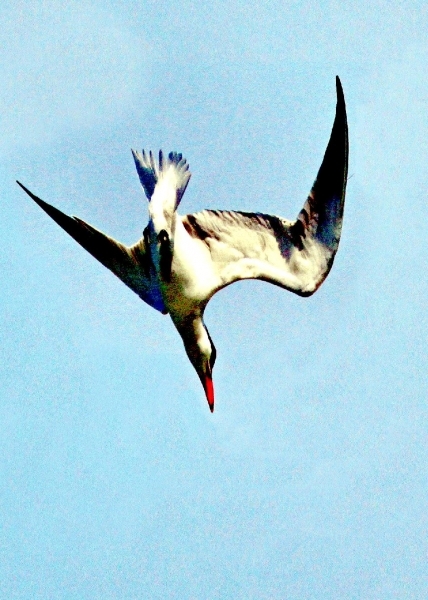 In flight, it shows black markings on the tips of its under wings and a slightly forked tail; the legs and feet are black. 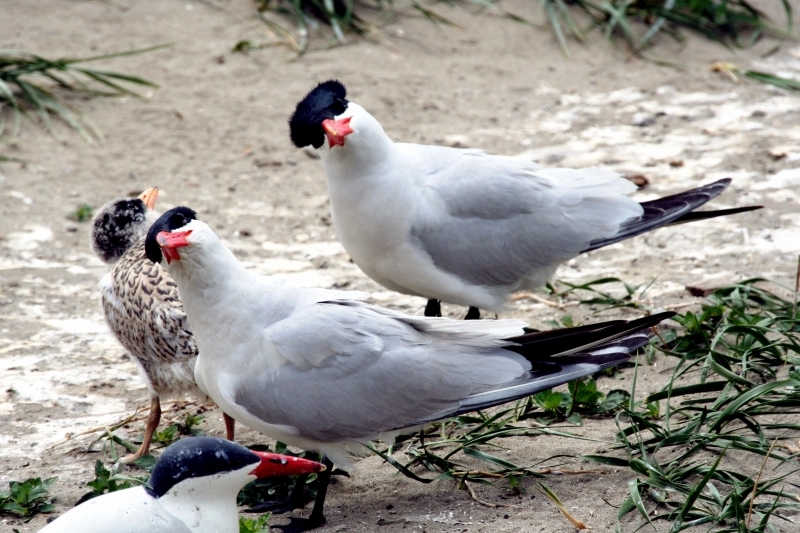 Non-breeding birds do not have a distinct cap. 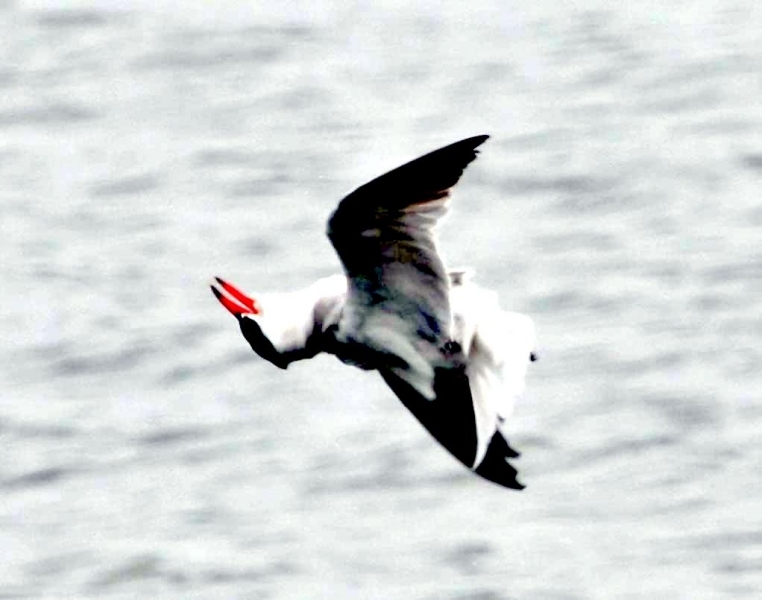 White mixes with the black and the cap recedes. 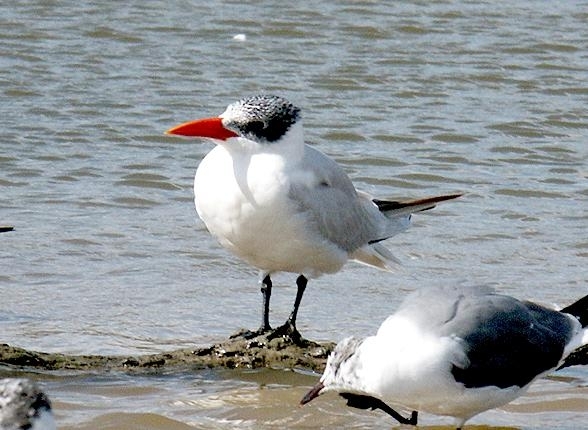 The young Caspian Tern has some brown mottling on the wings and more dark on the upper side of the wing tips. 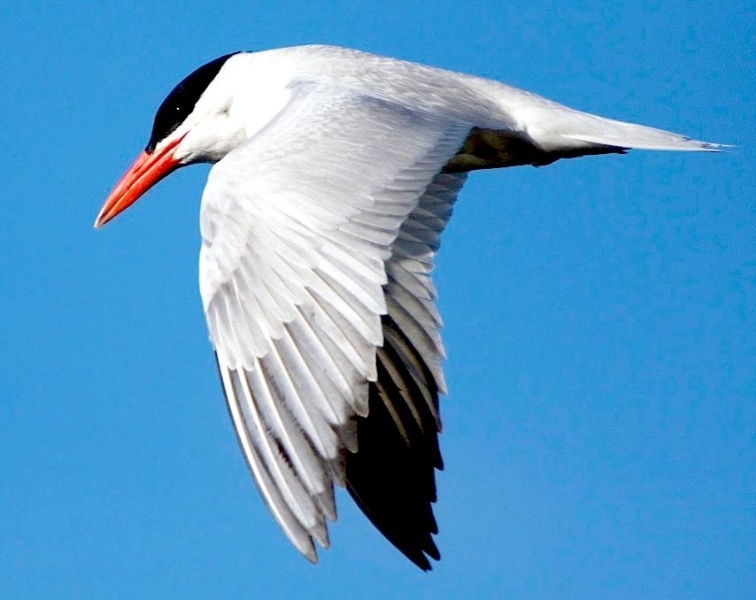 It closely resembles a Royal Tern but the wings are wider. 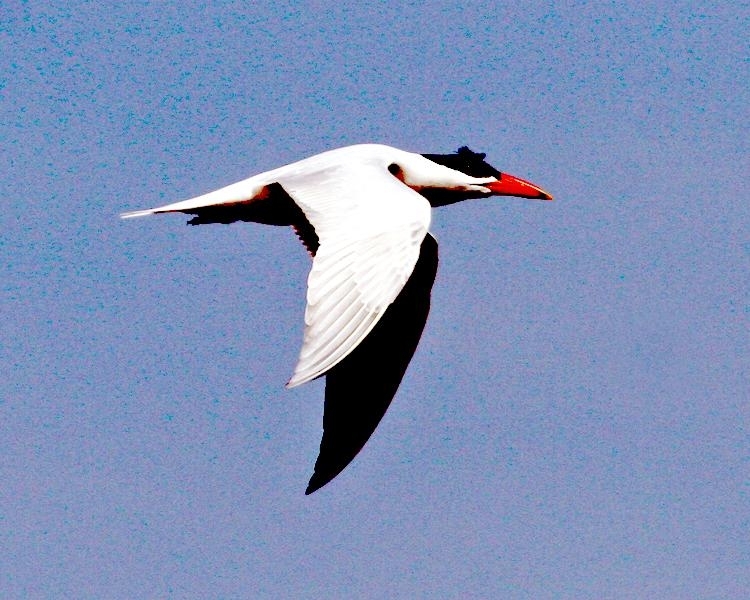 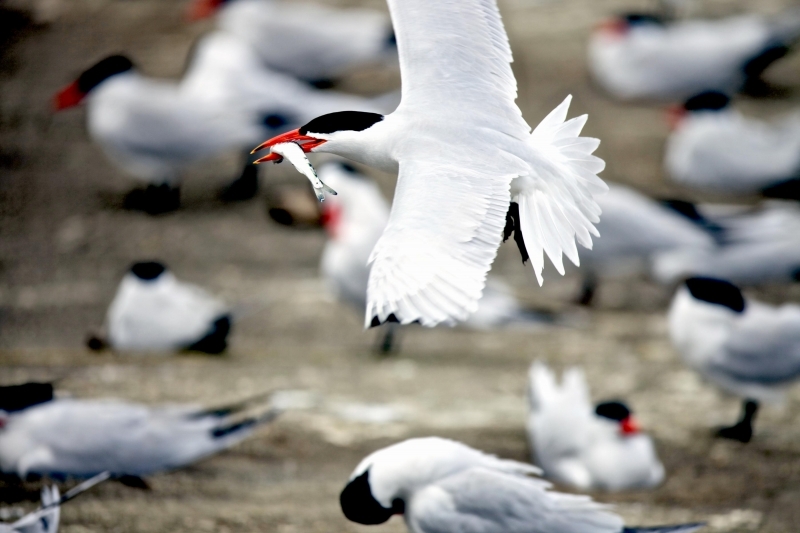 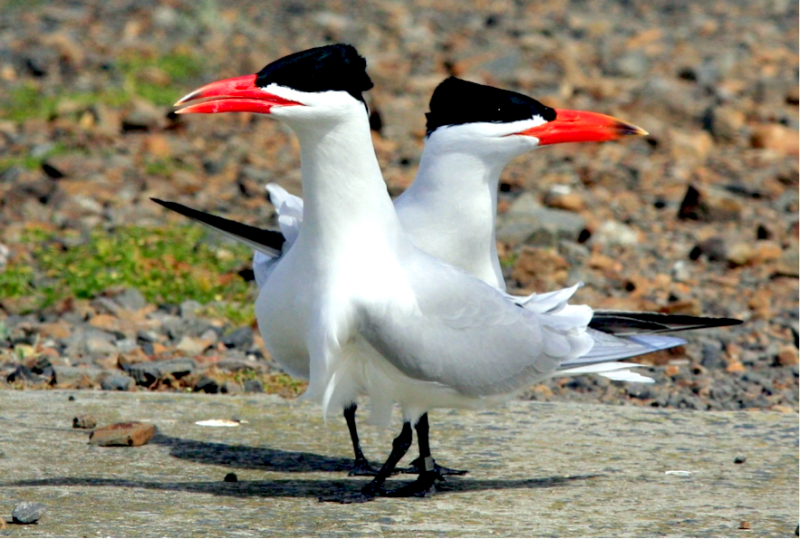 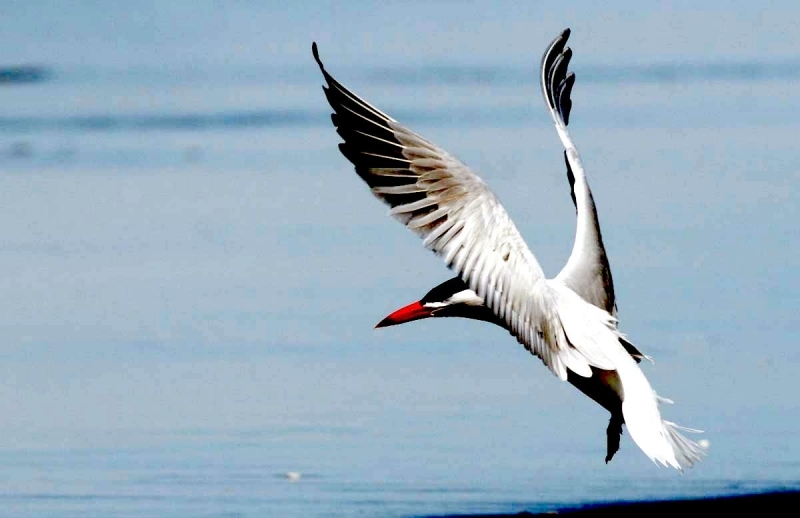 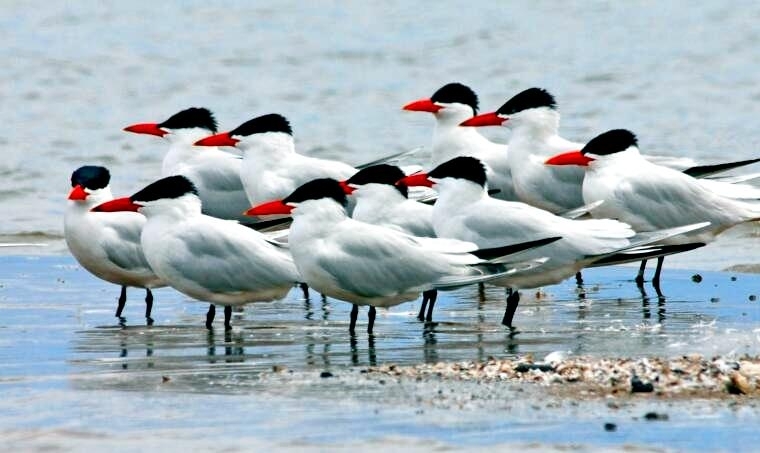 Caspian Terns are some of the most common & widespread terns. 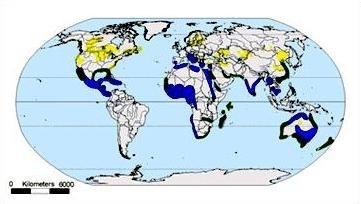 They are found on every continent except Antarctica. 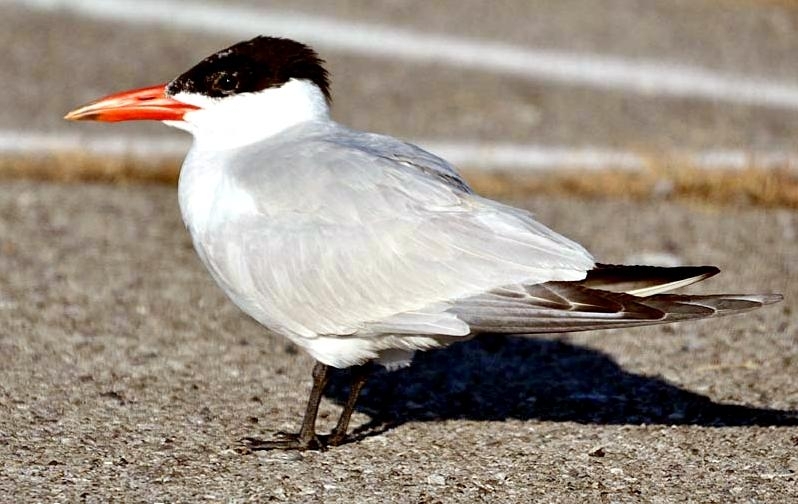 Look for them on the shores of lakes & large rivers, estuaries and along coasts. 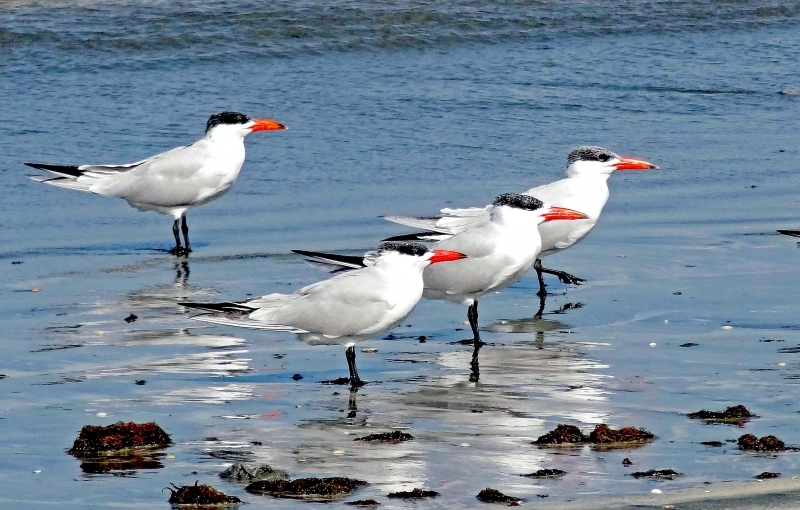 You probably won’t see them in the open ocean because they prefer to be in protected waters. 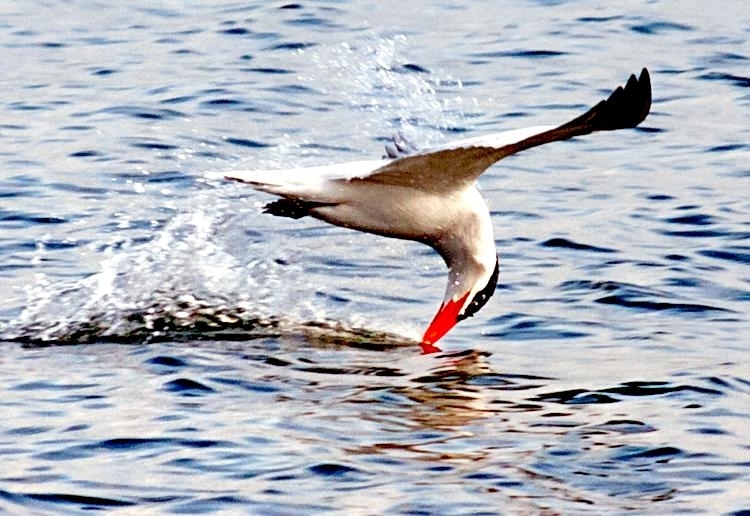 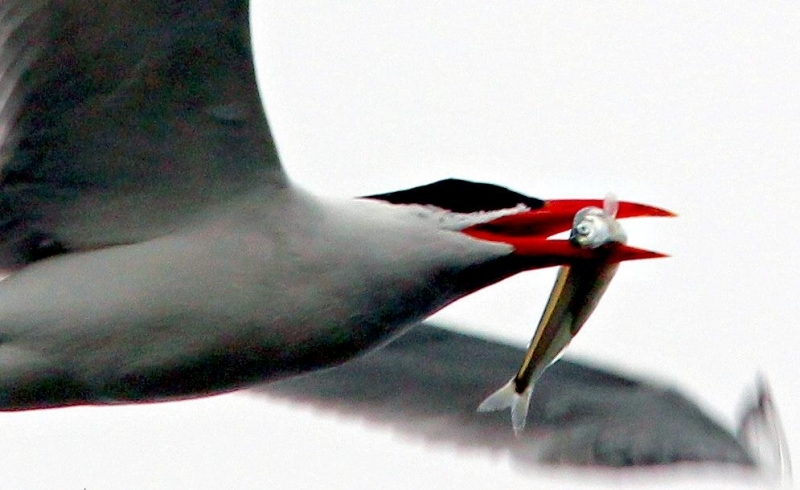 They hunt with their red bills pointed downward and can hover in the air when they spot a fish; then they will plunge into the water to catch the fish. 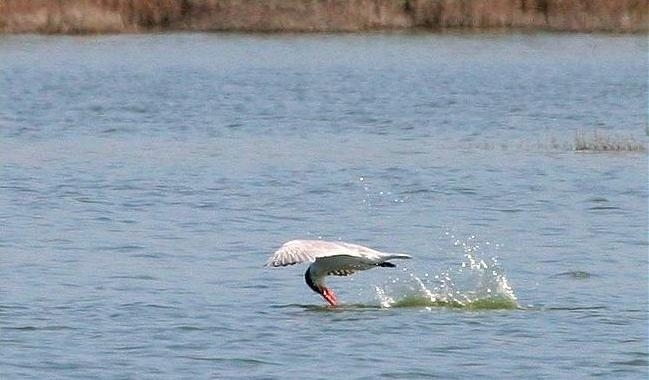 They will often be completely submerged. 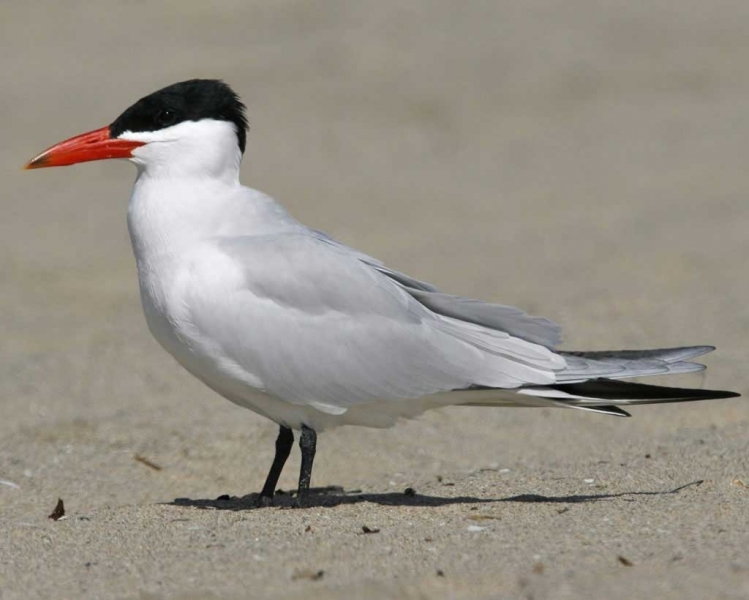 They are less gregarious and more predatory than most terns and readily will take small birds or eggs from nests of other terns. 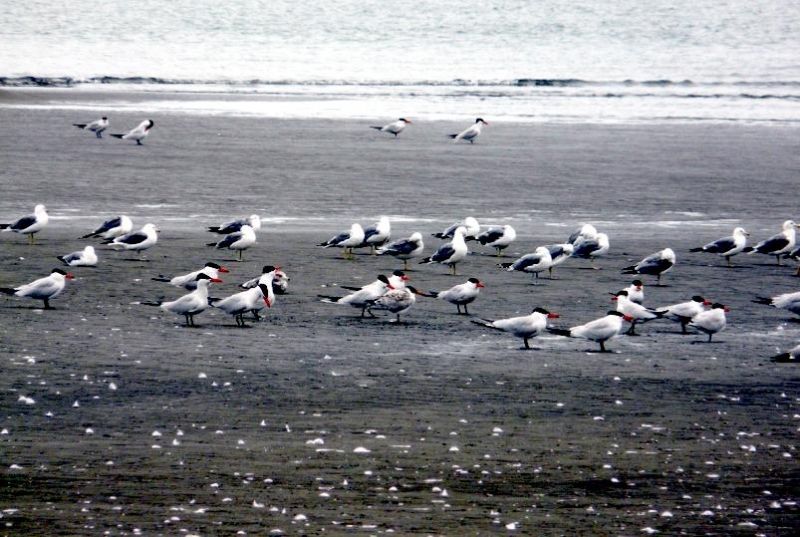 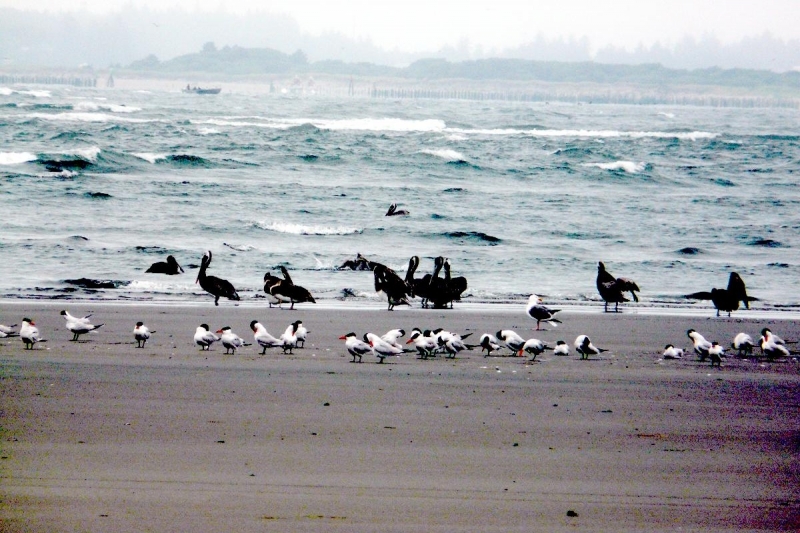 When not feeding, they can be found standing on mudflats in loose groups facing into the wind. 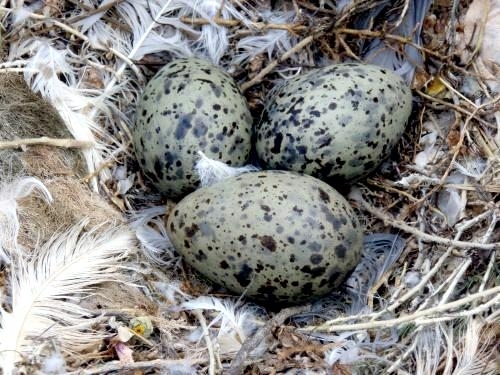 They have very raucous calls which sound like a harsh “Kraaa”. 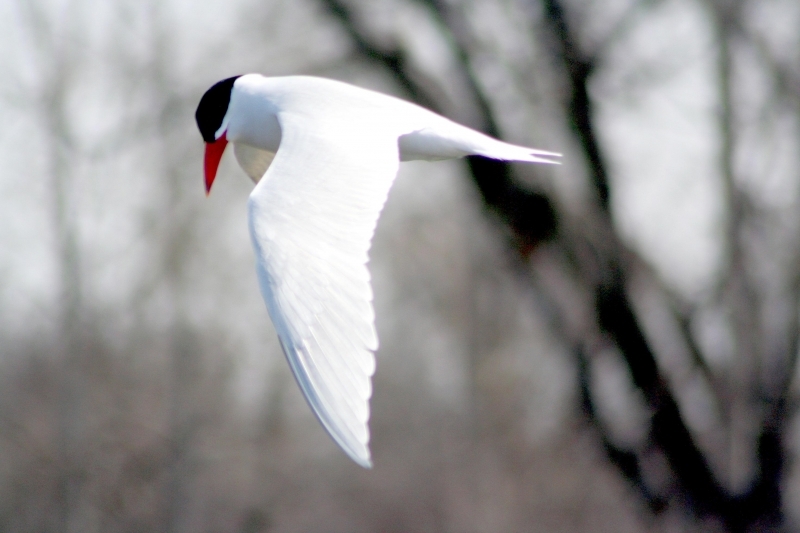 In flight, they soar like gulls. 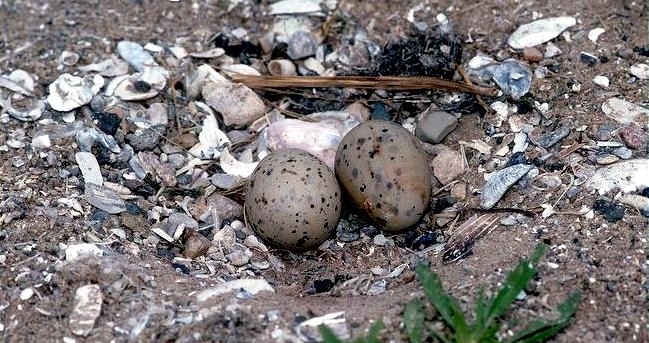 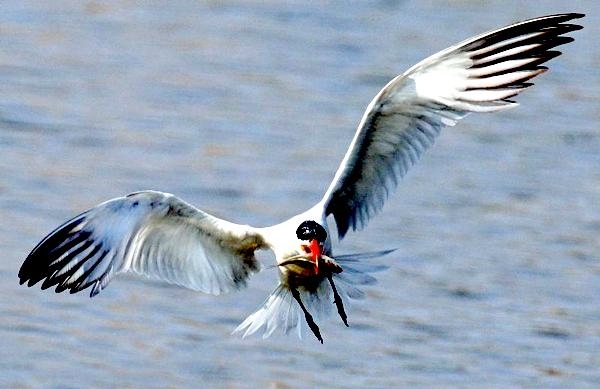 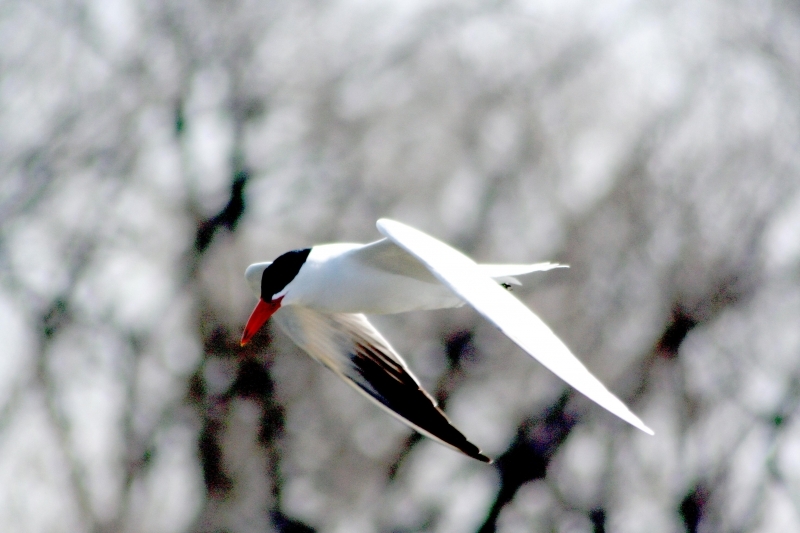 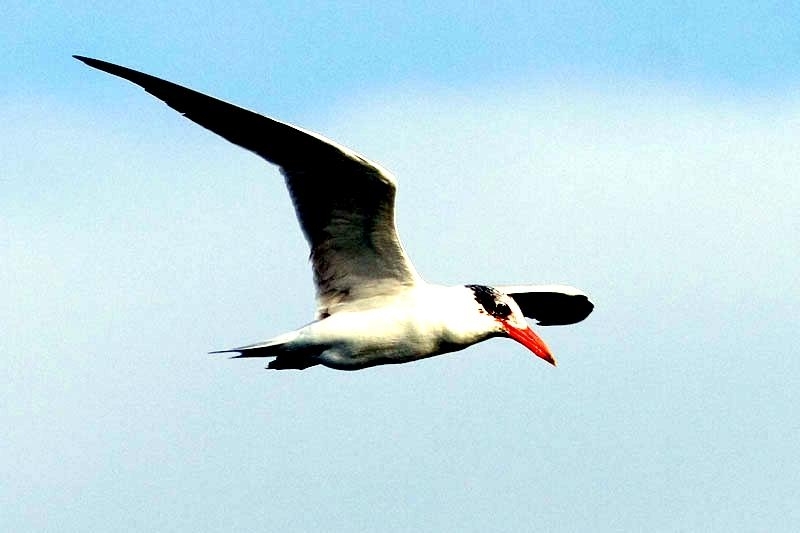 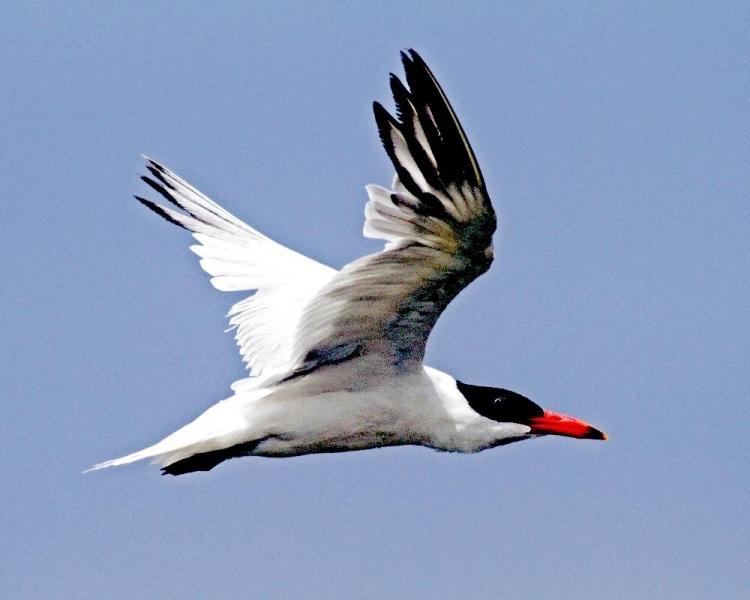 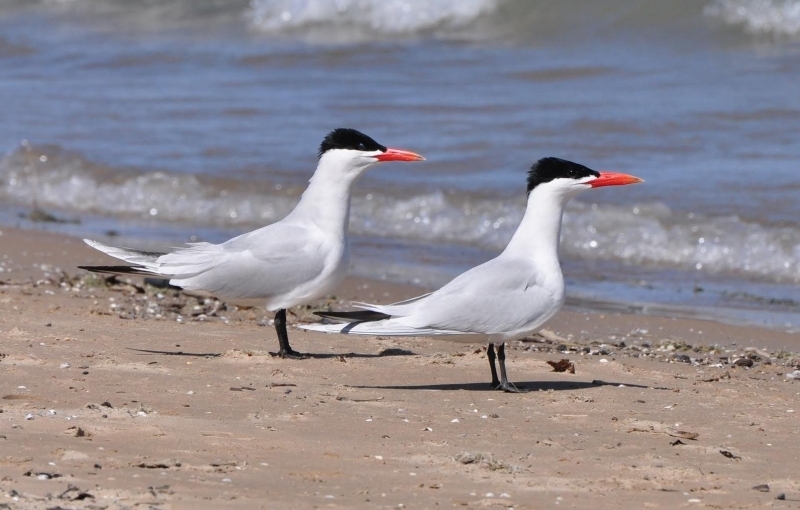 Caspian Terns do not breed until they are 3-years old. 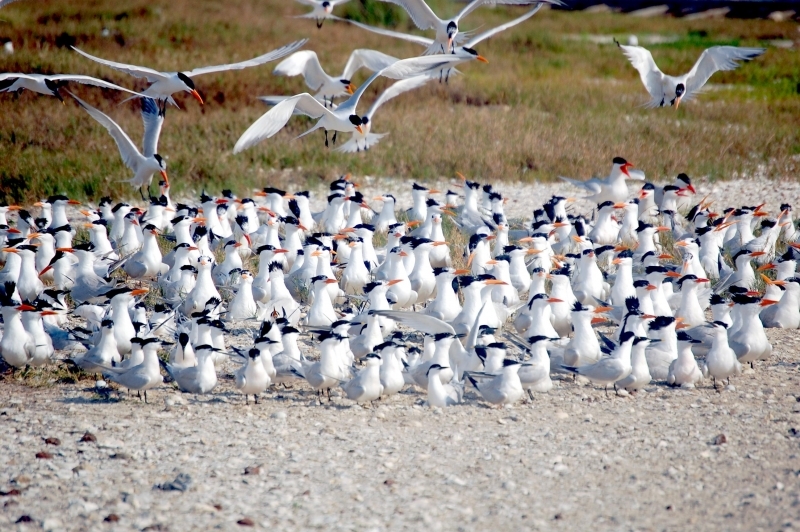 Pairs breed by themselves or in small colonies usually on islands. 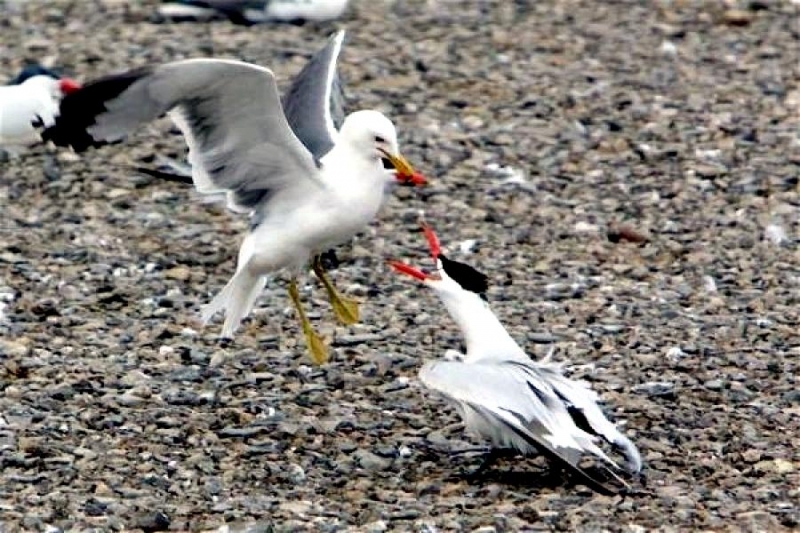 They may also attach themselves to colonies of Ring-Billed Gulls. 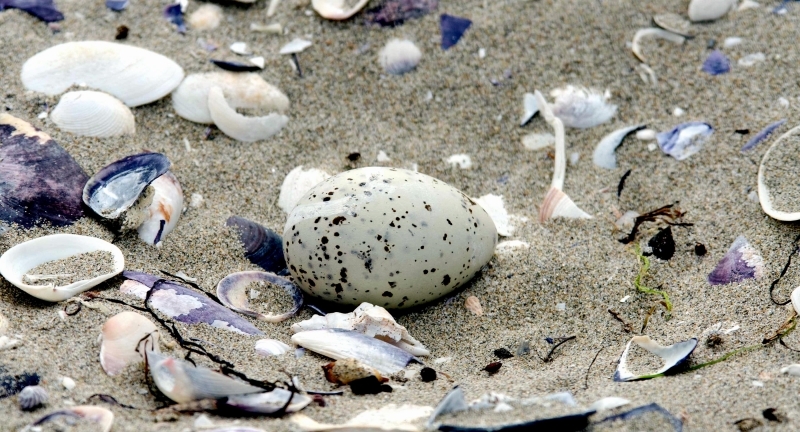 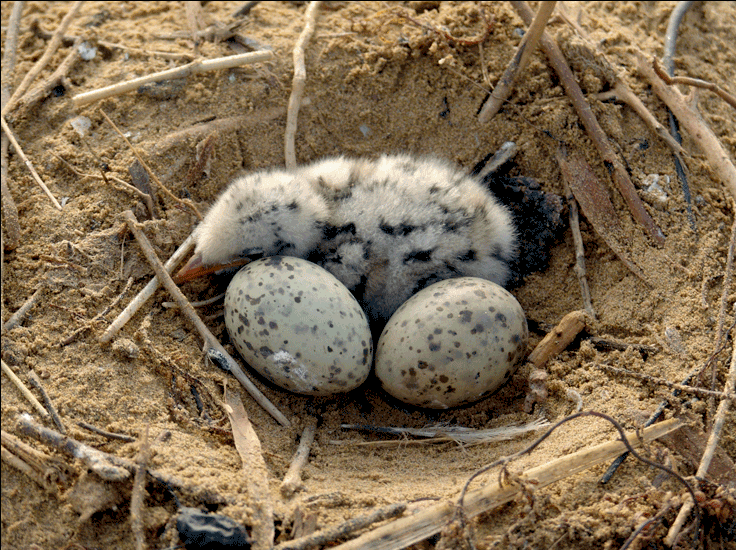 Both of the parents build the nest which is a shallow depression in the sand lined with vegetation & shells. 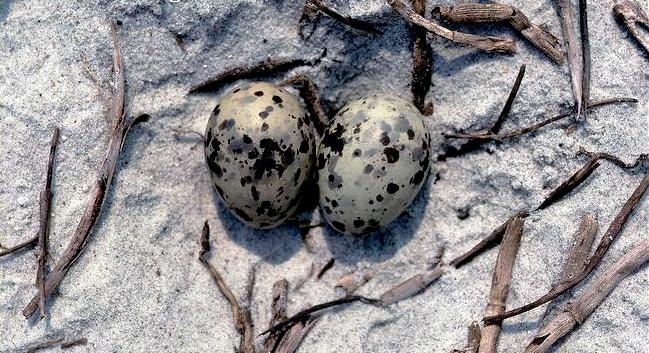 The female will lay 2-3 spotted buff eggs. 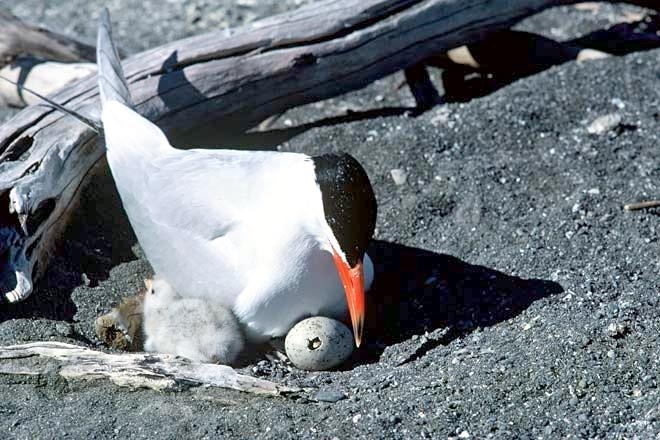 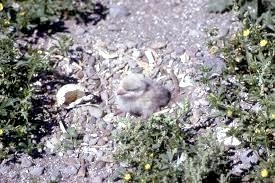 Both parents incubate the eggs and care for the young. 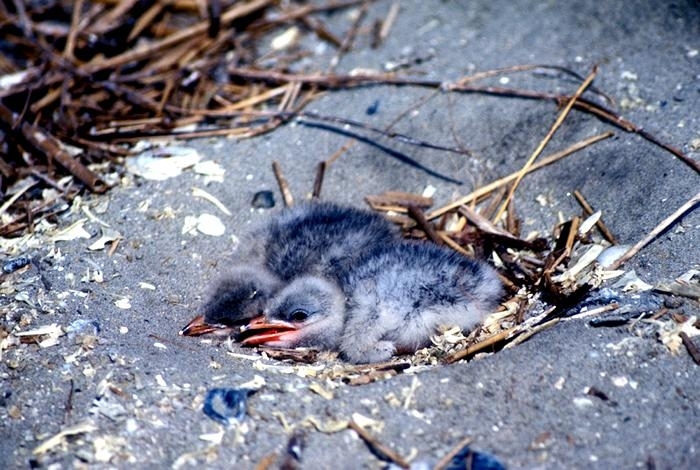 The young leave the nest in a couple of days but stay by the parents and are fed for about a month, until they are ready to fly. 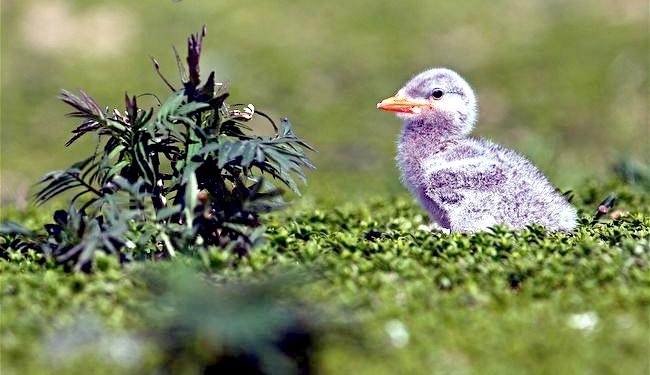 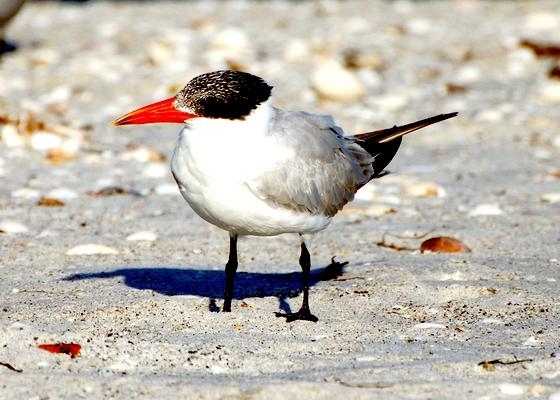 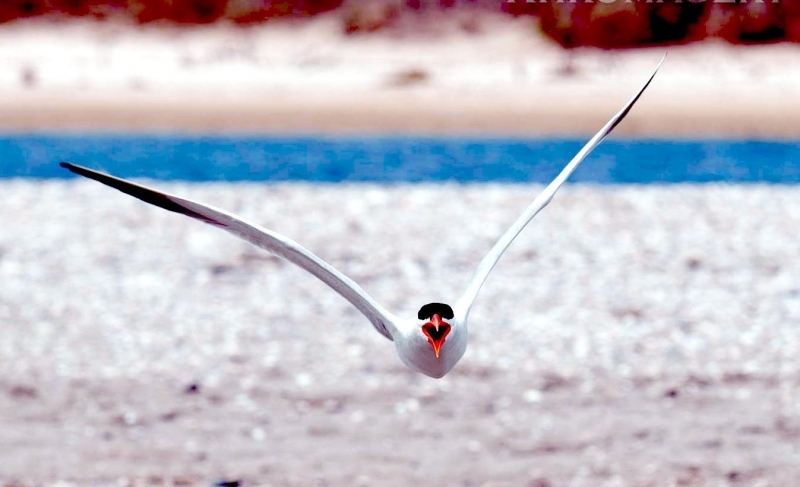 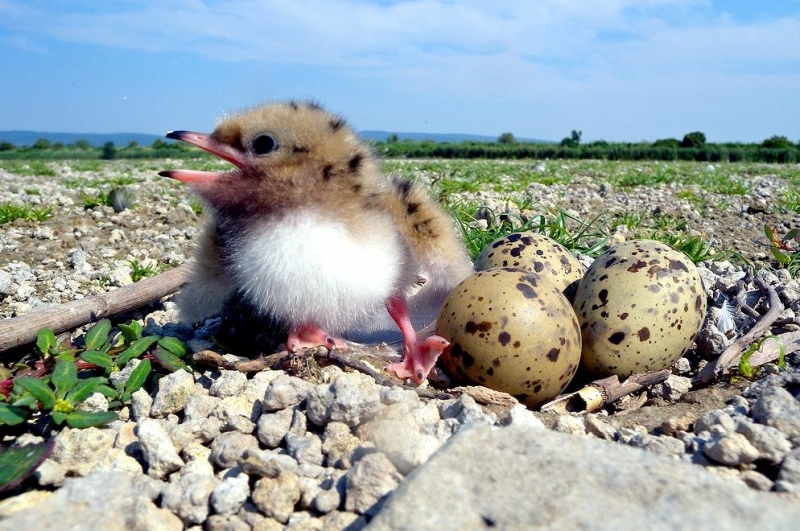 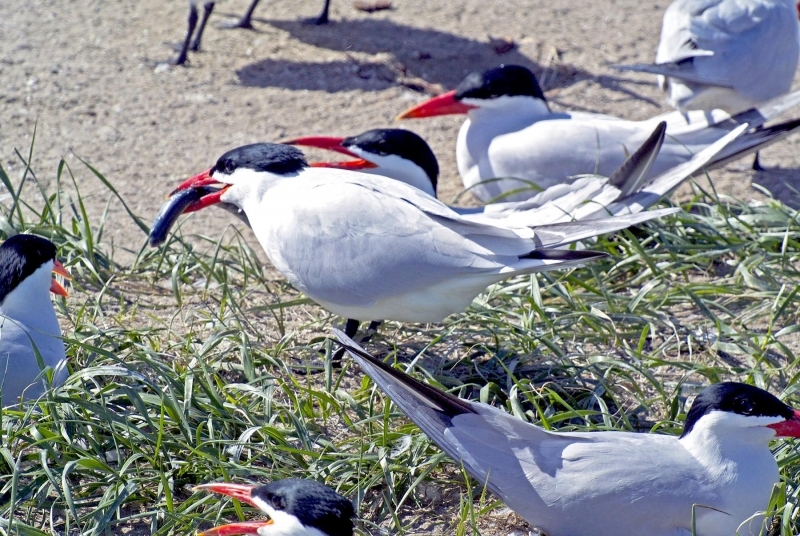 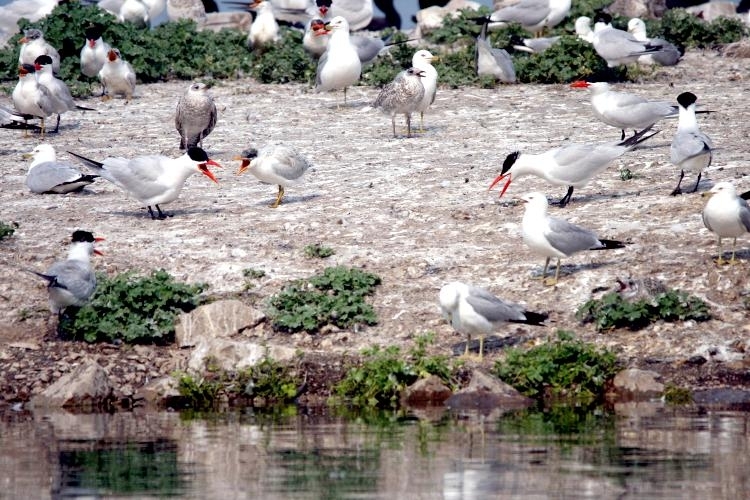 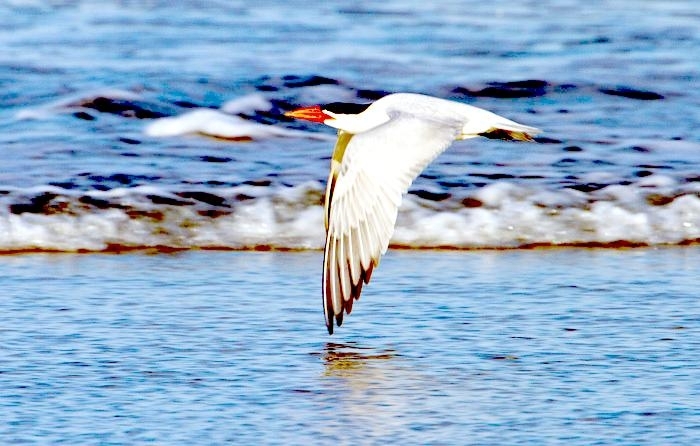 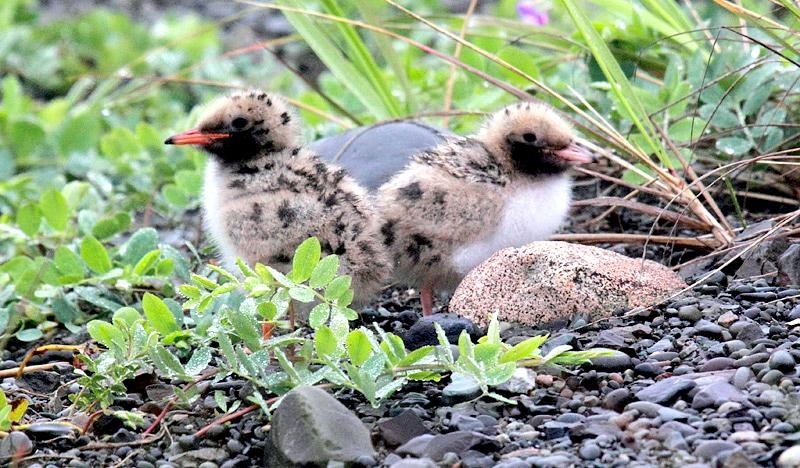 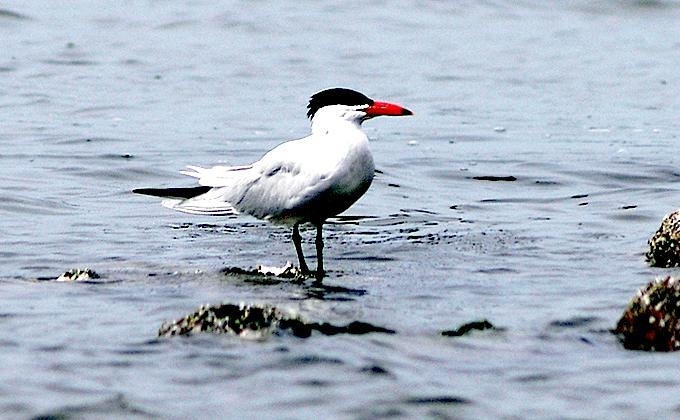 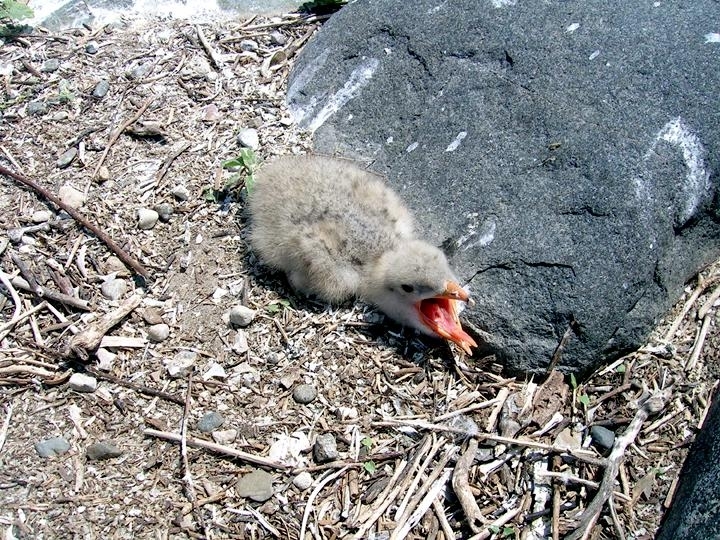 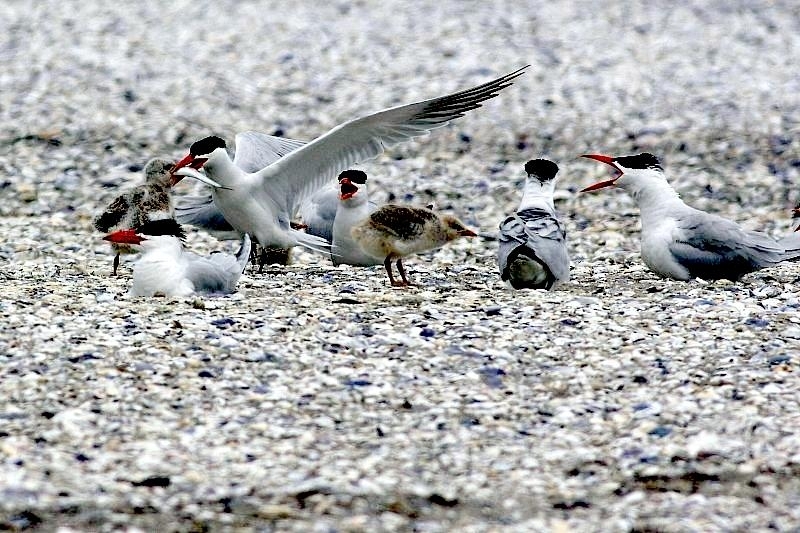 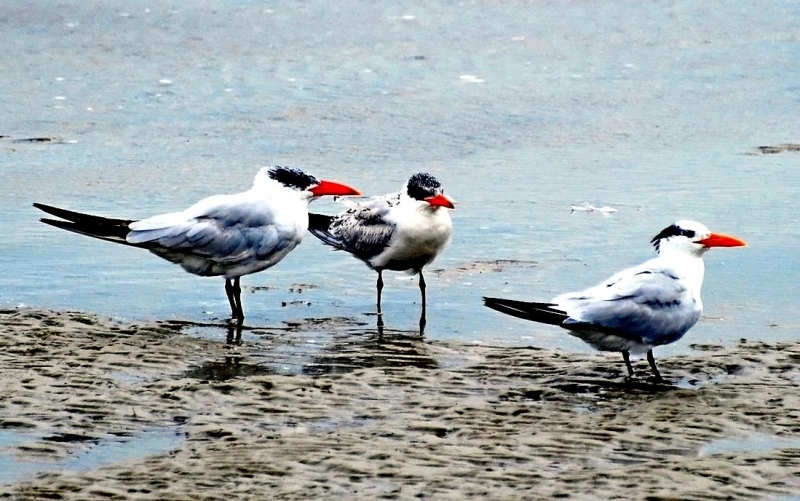 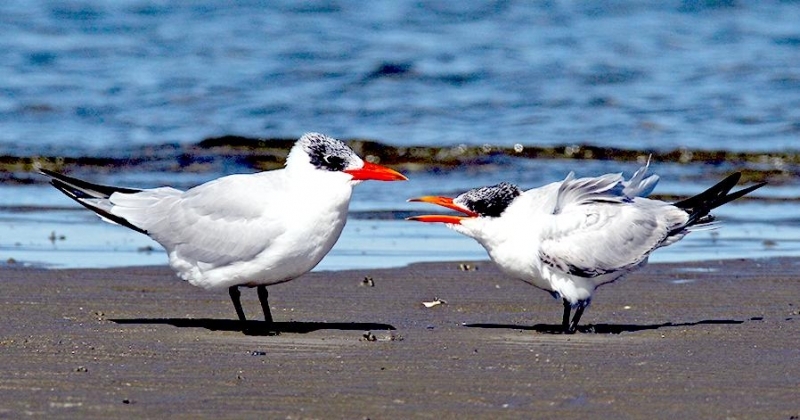 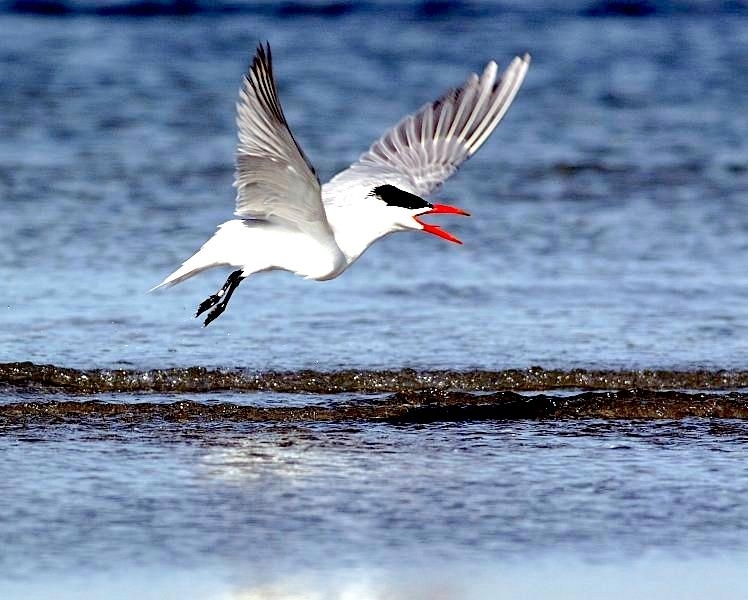 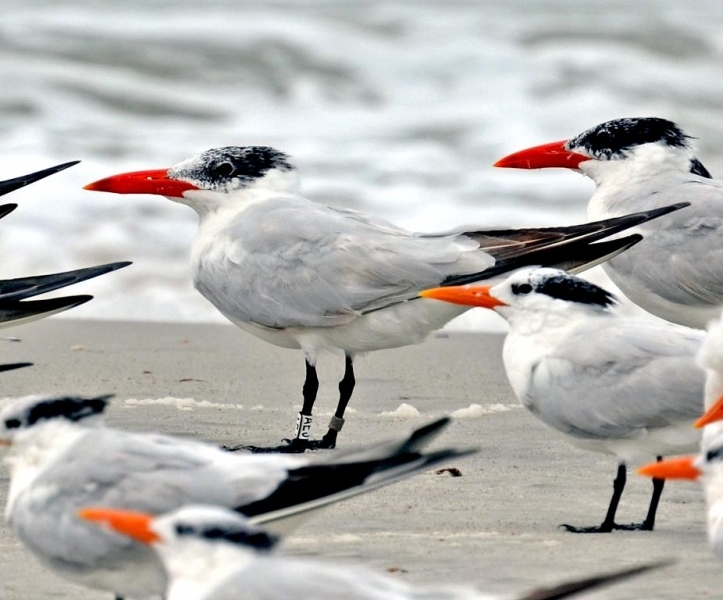 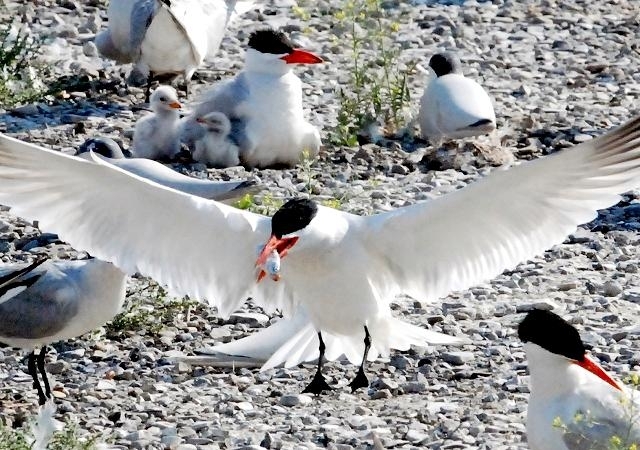 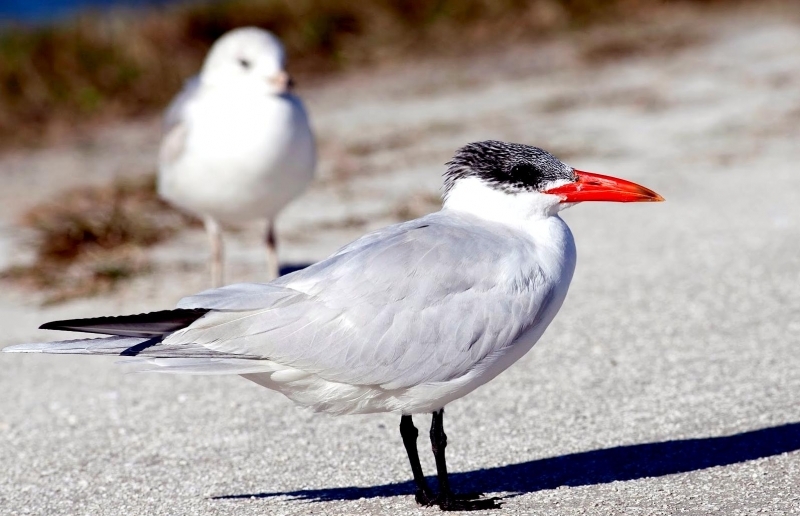 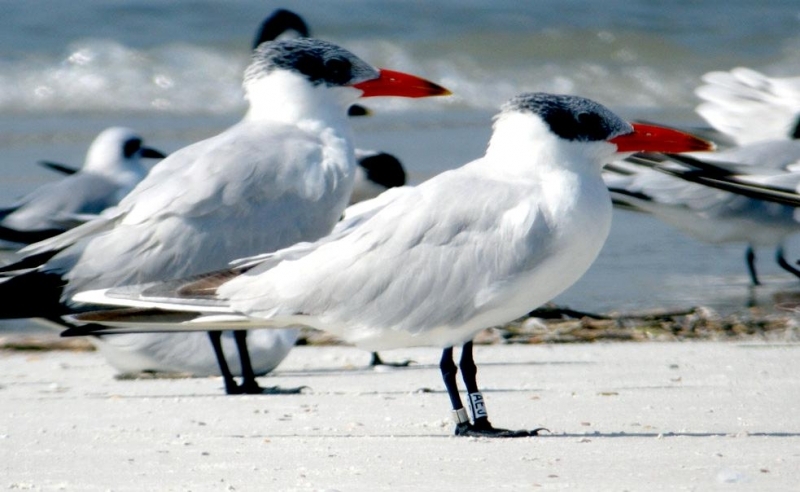 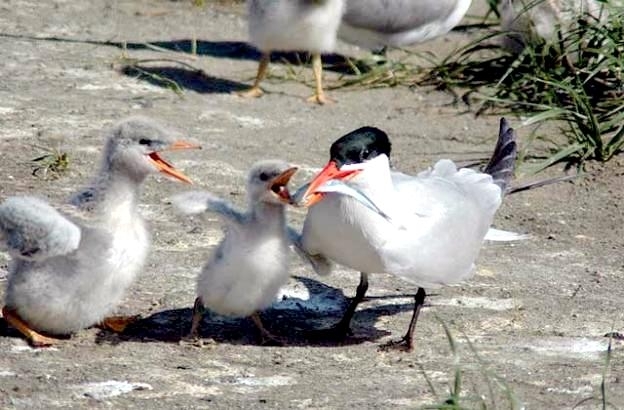 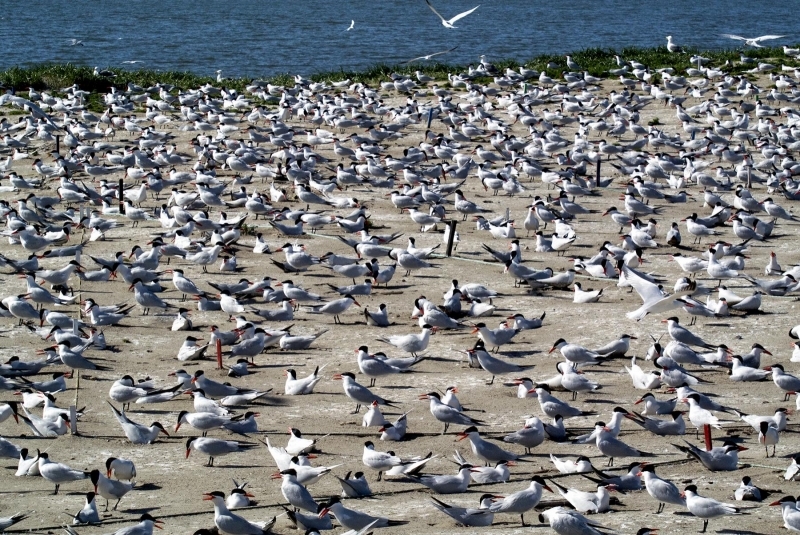 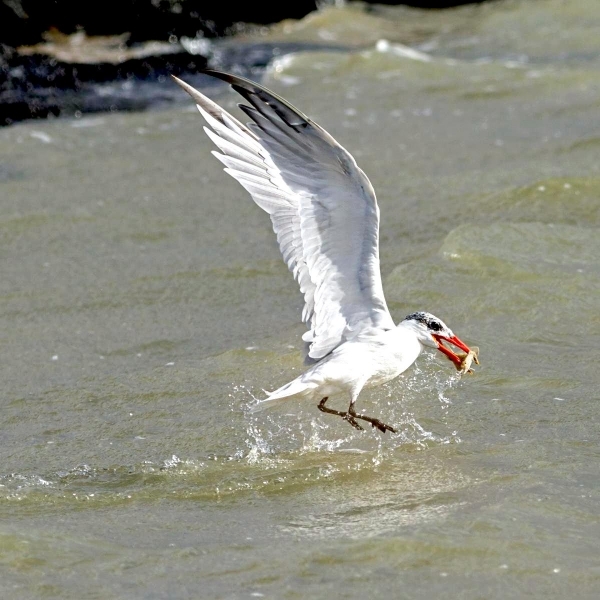 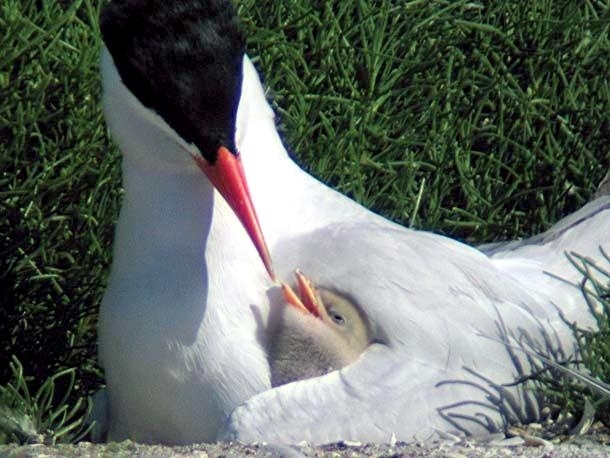 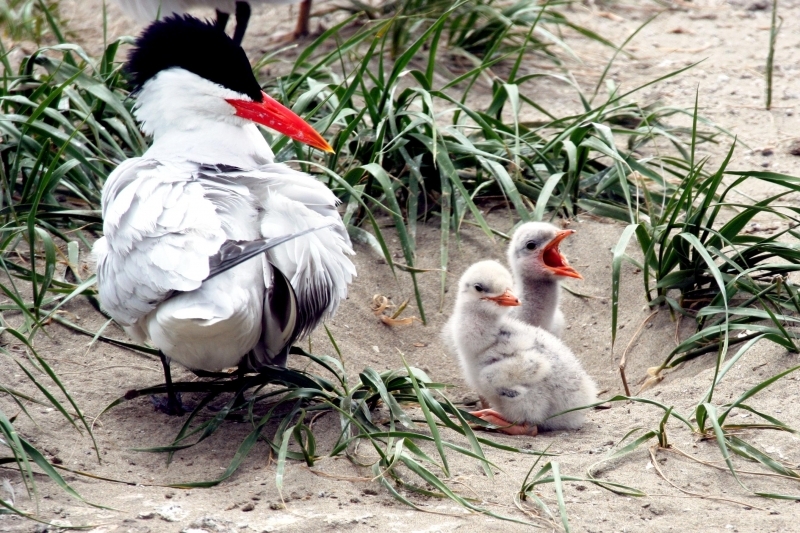 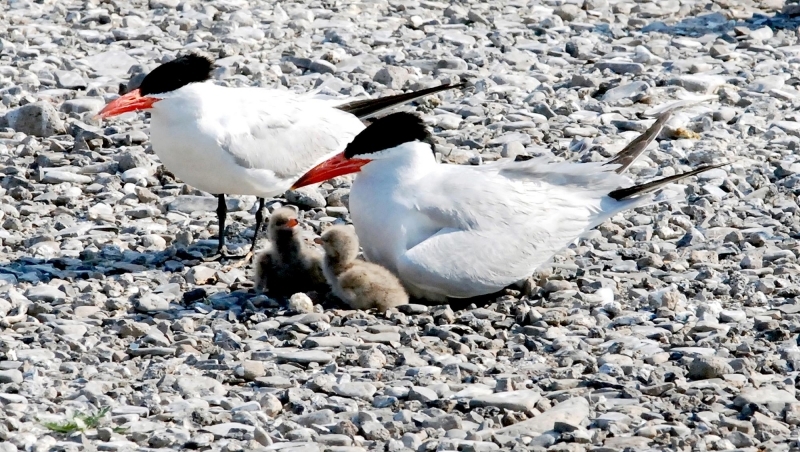 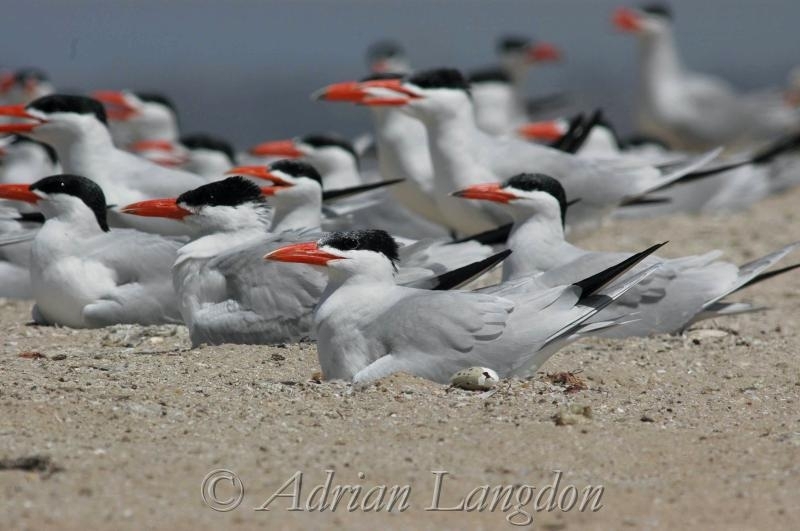 Young Caspian Terns may leave nest a few days after hatching, move to nearby shore. 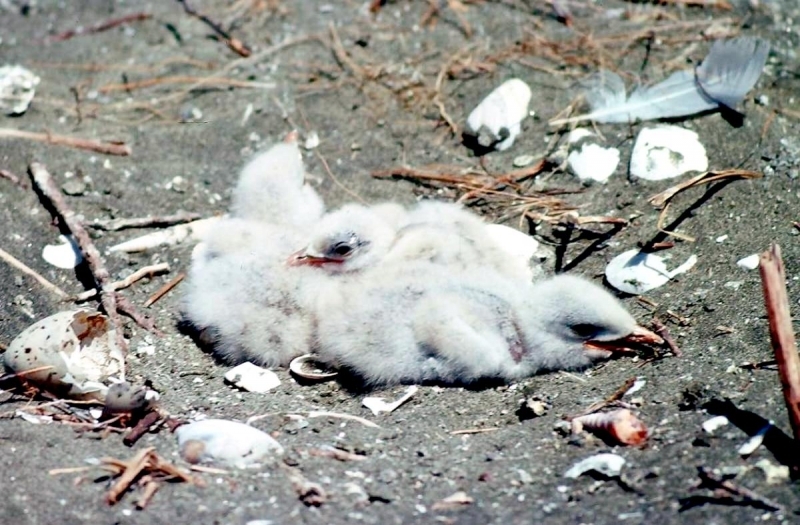 If the colony is undisturbed, young may remain at nest until ready to fly. 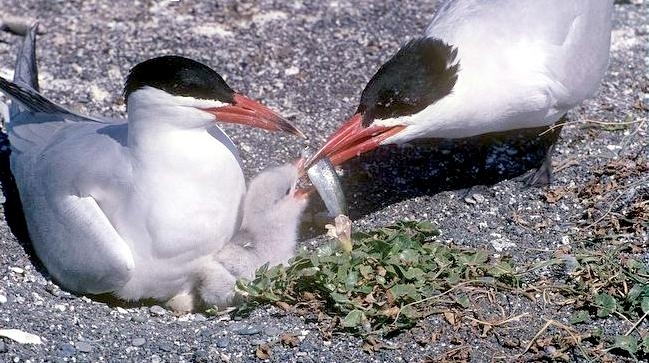 Both parents bring food to the young who have their first flight about 30-35 days after birth and may remain with parents as long as 8 months.